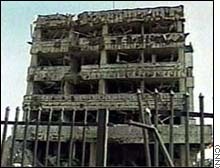 The NATO air strike on the Chinese Embassy in Belgrade on May 7, 1999 killed three people and injured 20. The bombing provoked anti-U.S. and anti-NATO protests, some of them violent, in 20 cities in China. 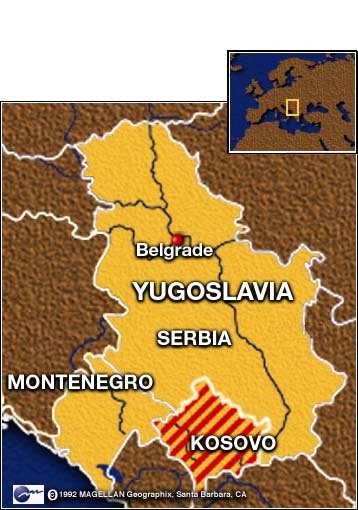 (CNN) -- It was late on a Saturday night this past May when Lea Durdin, an American student at Nanjing University, heard the news: China's embassy in Belgrade had been bombed during a NATO air raid on the Yugoslav capital. "We heard this roar of people chanting in the street," she remembers. 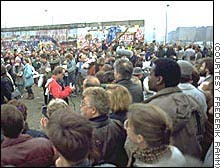 "The protesters began with chants against NATO. But soon, says Durdin, "someone started yelling Da dao Meiguo! ("Down with America! "), and then everyone who came by chanted that." Who do you think will be the dominant world power in the year 2050? As the protests continued into Sunday evening, Durdin says the banners became more anti-American. "People made posters of 'Americans' with huge noses and the shadow of a devil holding a bomb. Things were said about America picking on poorer countries just to improve our own economy ... that the citizens of the U.S. demanded the war, and that's why the government started it." In Beijing thousands of demonstrators besieged the U.S. Embassy, pelting it with stones and paint. The anger in China's streets over the bombing of its Belgrade embassy has since played itself out. But relations between China and the United States -- much like the walls of the U.S. Embassy building -- remain scarred. 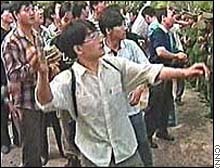 Protesters throw rocks at the U.S. Embassy in Beijing in the days following the NATO bombing. U.S. envoys later asked the Chinese government to pay for the damages from the protests. Allegations that China has for years stolen nuclear secrets from U.S. government laboratories. Allegations that China funneled hundreds of thousands of dollars in illegal campaign contributions to Democratic Party officials. America's blocking of China's entry into the World Trade Organization. Beijing has sought to join the WTO for the past 13 years -- but it must still work out a deal with the United States, its largest trading partner. 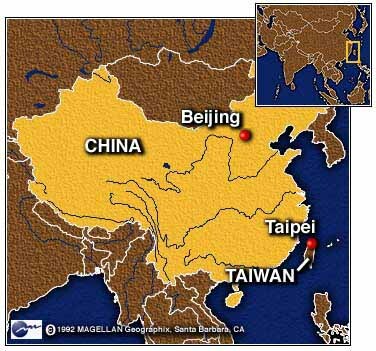 America's support of Taiwan, which China considers a renegade province. Continued accusations by U.S. activists and lawmakers of human rights abuses in China. Just over 10 years ago it appeared the two nations were at the start of a much more cooperative future. Chinese leader Deng Xiaoping and his reforms led many Americans to believe closer economic and political ties were in store. But the violent military crackdown on pro-democracy demonstrators in Beijing's Tiananmen Square in June 1989 changed U.S.-Chinese relations practically overnight. Every year in Washington since 1989, around the anniversary of the suppression of the Tiananmen demonstrations, U.S. lawmakers have debated whether Washington should renew its Most Favored Nation trading status, now known as Normal Trading Relations (NTR), with China. The status must be renewed every year under U.S. law. Other sticking points in recent years include the U.S. accusation that China has sold nuclear and missile technology to Pakistan -- an allegation China has denied. 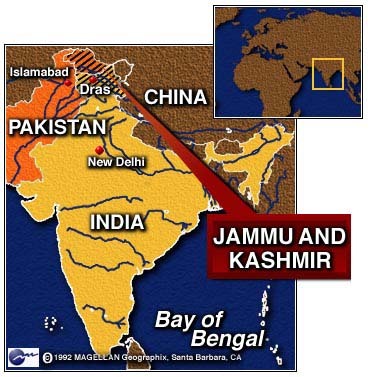 Western officials feared such technology transfers would increase the possibility of a nuclear confrontation between Pakistan and its longtime rival, India. 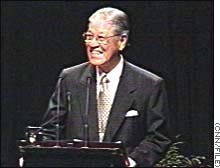 In 1995 officials in Beijing were outraged when Taiwan President Lee Teng-hui was allowed into the United States on what was characterized as a "private" visit. A year later, China's show of military force in the Taiwan Strait prompted the United States to send two aircraft carrier groups into the region. Adding to this atmosphere of distrust in 1996 was the best-selling book, "China Can Say No," a collection of essays by five 30-something Chinese intellectuals, including two journalists, a poet and a university professor. The 435-page book calls on Chinese to embrace their own sense of identity and say "no" to political, economic and cultural influences from the United States, Britain, Japan and other nations, countries the authors argue hinder China's emergence as a world power. Along with the tensions, however, have come moments of China-U.S. cooperation. 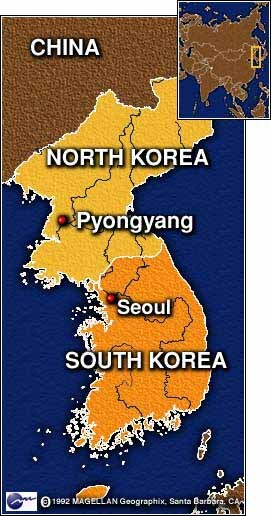 The two nations have been working together to bring a peaceful resolution to the decades-long tensions between North and South Korea. The United States and China also have one of the largest trading relationships in the world -- although a trade deficit in China's favor, estimated at $57 billion, has been a source of American irritation. "What we have is two great powers who are suspicious of each other," says Robert Ross, professor of political science at Boston College. "I think we are going to naturally focus on the country that presents the greatest challenge to our national interests. To the United States that means China, to China that's the U.S."
Ross, a former Fulbright professor at the College of Foreign Affairs in Beijing, believes the collapse of the Soviet Union and the end of the Cold War have led many in the United States to wrongly look on China as America's next great Cold War rival -- with all the fears that accompanied the U.S.-Soviet rivalry. "The U.S.-Soviet relationship was one of the worst bipolar controversies in history," he says. "It's wrong to assume that all great power confrontations are like that. With U.S.-China relations we won't have arms races, the Cuban Missile Crisis, or proxy wars in the Third World." For its part, China appears to be increasingly worried by U.S. military expansion in the post-Cold War world. 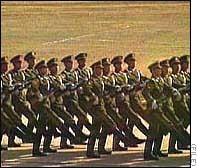 According to London's Financial Times, NATO's actions in Kosovo prompted one senior Chinese official to wonder: "Where will NATO stop? 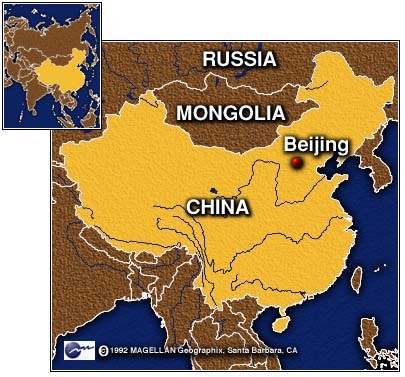 Will they next intervene in Azerbaijan or maybe in Tajikistan on China's border?" China's attempts to modernize its massive military have also raised concerns in the United States. Winston Lord, who has been at the forefront of China-U.S. relations for three decades, is cautiously optimistic about the future. "Right now, obviously, we're in a delicate and difficult phase," Lord says, "but we've gone through tough phases before. China still needs us for geopolitical and economic reasons, at least for a couple of decades." 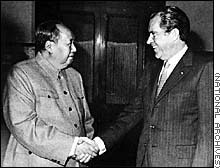 Lord, who accompanied U.S. President Richard Nixon on his historic 1972 visit to Beijing and was U.S. ambassador to China from 1985 to 1989, describes China as a "proud nation, nationalistic, the Middle Kingdom for four or five thousand years ... a curious mix of self-confidence and pride on one hand, humiliation by foreigners on the other." And the Chinese government, Lord notes, "is playing on this emotion. As they discard Marxism, there is a sense of a lack of values. In addition to trying to lift the standards of living, the Communist Party appeals to nationalism -- 'We were No. 1 once, we'll be No. 1 again.'" 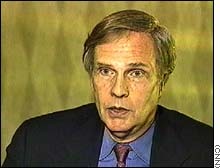 Lord, who served five U.S. presidents, most recently as assistant secretary of state for East Asian and Pacific affairs in the Clinton administration, says the reports of anti-American sentiment in China should not be exaggerated -- nor should the U.S. perspective of China be fueled only by certain issues. "The debate has gotten distorted in this country," he says. "For many it boils down to money versus morality. I'm in favor of pressing China on human rights. A more open and democratic China at home would mean a more friendly and benign China abroad. I also believe in expanding economic links. But these are not the only two issues. [U.S.] presidential leadership is important -- to stress more than economic and human rights. There are areas of possible cooperation, like Korea, South Asia, drugs, crime and the environment." Lord says the ongoing controversy of Taiwan's status will be the "wild card" in future Chinese-U.S. relations. 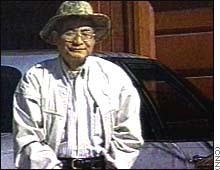 In any event, he predicted a "mixed bag of competition and cooperation" between Beijing and Washington. "I think [China's] government will be more open," he says. "I'm not predicting a Jeffersonian democracy. But with a new generation, the more they are open domestically the less aggressive they will be overseas. ... [However] if China continues to be as tight-fisted, as paranoid, as nationalistic as now, then there's going to be a difficult relationship."